Fixed a bug in the class comparison tool introduced in the 1.5 update. Also not mentioned in the previous update: added Blind godstone to skills list. Updated NotAion launch code to work with their recent server change. Added options to popup-menus in skills window to sum selected/all hits in the upper box. Improved the copy format for skills in the skills window. Added “Extended” menu to copy damage data beyond the 255-character limit of Aion client (can’t paste in-game). 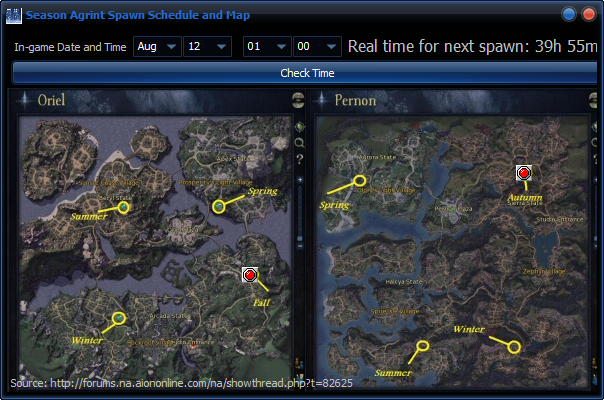 Screenshots: fixed the issue where the screenshots contained the ARM window or the screenshotter itself if it launched over the Aion client (common issue to players with a single monitor). “Graphs/Analysis” menu has been removed in favor of a live version of the filters, which you can apply anytime to the current view, so new incoming data will also be filtered by class/mobs. Added also a button to show only PVP damage (without removing PVE data as was the case before). The copy data functions will also work with the filters, giving data only about the filtered view. It hasn’t been thoroughly tested so beta status for now, please report any issues/bugs. Added auto-scroll back, it’s still a bit buggy though. Fixed: agrint tree timer was slowing down after a few hours, ending up with some minutes off the time. 1) Here’s the awaited update to fix the issues with crashes/”access violation” from the previous 1.32 version. 3) Many users have requested I make the program work for German and French clients, but it’s not an easy task. It involves a lot of work and requires having someone come online with me and help me translate and analyze/compare a LOT of text from the log, in many different pve/pvp situations, for all classes etc, then putting it into a new module in ARM and then a lot of manual work. Contrary to what many believe, it’s not a simple list of strings that go through some regex proc; I don’t use regex, at all. The parsing is a long complicated process with many steps, pre-fixes, pre/post-analysis of different lines for a single skill etc, that’s how ARM manages to be so far beyond any previous meters in its accuracy. So, I rejected the petitions to do this, but I am now considering the possibility if I receive enough donations for every specific language. Please comment in this post what you think about this. I decided to disable the hacker warnings from the log analysis (thorough process that tries to detect patterns from various popular cheating tools), as well as pre-determined hacker names after they had been deemed to be cheating and many of them banned, except for some cases of repeating offenders. You can still make your own trigger-list however, under Tools/Players database, Add player with score “Hacker”, so you will get a warning. You are still encouraged to report everyone you deem suspicious, by using the “generate hacker report” feature under player-right-click, and include the log etc in the ticket to the publisher. This isn’t final however, and might be bound to change back in the future. Been considering making ARM subscription-based with a small fee like 2-3 euro a month. What you think? Would you pay a monthly fee to use ARM? That’s the sad state of the European version of Aion, where simply contradicting your opinion about drop rates against some mod gets you banned, they think really highly about themselves. The worst offenders would be Lord_Fren and Seven, there must be something very wrong in their head. Either that or they are explicitly told to lie and ban users who expose the truths about the greedy business model they forcibly imposed on the userbase GF purchased. There is a bug in the last version of ARM, happening to everyone. It’s almost fixed and I’ll publish the update tomorrow, keep checking the site for news. Some bug fixes that caused a crash sometimes when loading a session file. After checking the time, a timer will start, updating the ETA every second, as well as showing the time on the taskbar and flashing the button when there’s less than 30 minutes left. All rolls in-game will be detected and added to this new tab. When selected, 2 new buttons appear “clear rolls, sort rolls”. By clicking on sort, the rolls will be sorted from highest to lowest. Changed the time between chat window pruning, from 1 to 5 minutes (1000 lines). Added a button “scroll to bottom”. for the main chat tabs. Added tool: Season Agrint Schedule. 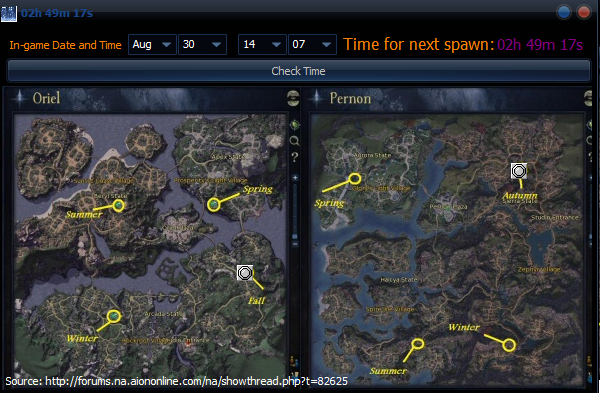 This will tell you when and where the next tree will spawn.